Edgar Rice Burroughs® iconic hero, Tarzan®, is the most filmed character in Motion Picture history. # of Publications & Licensed Products: 1,000’s including the 27 Tarzan adventure novels written by Edgar Rice Burroughs™ written over a 40-year period. A new animated TV production (8 x 22’), produced by 41 Entertainment, is an original series produced for NetFlix. 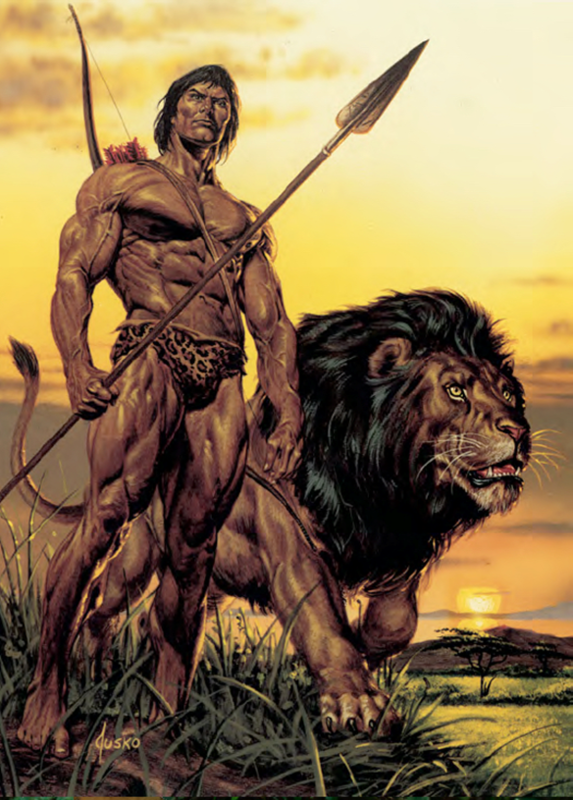 Story Synopsis: Tarzan is found in the jungle as a baby after his parents die in a plane crash and is saved at birth from his airplane injuries by a local medicine man who injected him with various lotion and potions from animal DNA’s that we later learn have given him great powers such as the speed of a cheetah and the strength of a rhino. He is raised in the jungle by a Managani until the age of 15 at which point he is found by an expedition from London paid for by his billionaire grandfather. This is where we meet Jane who is part of the expedition and becomes a very important person in his life and in our story as his equal. One of Aristocrat’s most successful game theme franchises, Tarzan™ is a true jackpot chase game for both local and destination players. It’s industry-leading ergonomic design delivers player comfort to optimize play time. The sleek, arc-double cabinet features dual 42” curved high-definition LCD touch screens that encompass the player for a holistically unified experience. 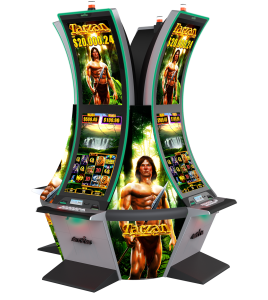 Tarzan™ offers a single-level multi-site progressive and two standalone progressive jackpots with resets of $20,000, $100 and $20. Free games up the jackpot excitement as the wheel feature multiplier is also applied to all winning major and minor jackpots. Authorized Tarzan® licensees can go wild with the jungle and environmental themes inherent in the Tarzan legend – both for vintage and contemporary design collections. And, Tarzan’s trademarked primal yell is great for advertising and social media initiatives. Tarzan® and Tarzan & Jane™ also offer great ADVERTISING & PROMOTIONS partnership opportunities for companies seeking universally recognized and beloved spokes-characters to convey corporate messages of sustainability and social responsibility. ©2018 Edgar Rice Burroughs, Inc. All Rights Reserved. Tarzan®, Tarzan & Jane™ and Edgar Rice Burroughs® are owned by Edgar Rice Burroughs, Inc. and Used by Permission. CLICK HERE TO SEE MORE ABOUT "THE LOST WORLDS OF EDGAR RICE BURROUGHS®"
Interested In Becoming A Tarzan® Licensee?